This interview with Ayeyemi Taofeek Kehinde opens our series of interviews with the four winners of the Poetic Wednesdays 2nd Anniversary Poetry Contest co-sponsored by the Arts-Muse Fair blog. 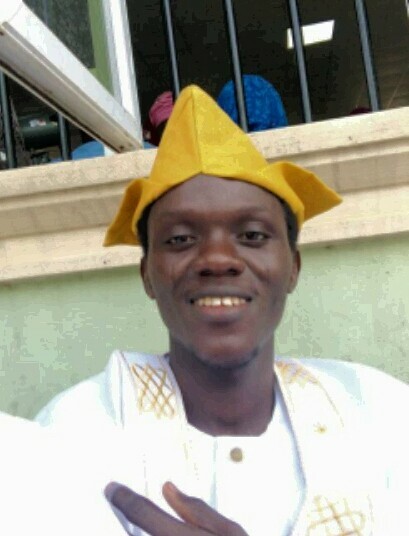 Fondly called Aswagaawy, Ayeyemi Taofeek Kehinde is the author of "Oro n Bo: Dripping Words" (a poetry collection). Winning poetry competitions seem to come easy to him. His list of winnings include the First Runner-up of the BPPC September 2017 and February 2018, TAJIF Poetry Contest 2017, First Runner-up of Okigbo Poetry Prize (University of Ibadan, 2016), 4 times winner PIN Monthly Poetry Challenge among other prizes, awards and honorary mentions. He is published in Authorpedia, The Quills, The Pengician, Tuck Magazine, Inspired Magazine, Peregrine Reads and other online platforms. Here, Aswagaawy chats with Salim Yunusa on his poetry and more. Being a Bar aspirant at the moment, my profession is a course you'd have to pass Literature-in-English before you're admitted. Personally, I didn't move near admission because I didn't pass Literature in my WASSCE since 2007 until 2010 that I clenched my teeth tightly to it and eventually had a B. Preparing for JAMB in 2011, I also dissolved myself in the subject and all these affirmed my root in poetry. When I started writing poetry in 2015, it was like eating pap with Akara balls, and because law is a course for avid readers and writers, reading deep into the forms of poetry and writing same was not and has not been a boring exercise. Poetic Wednesdays just celebrated its second Anniversary. Can you tell us what impact being a member has made in your literary journey? Poetic Wednesdays brought my mind closer to poetry because of the weekly drillings such as the themed writing, themeless writing and picture prompt, and because more than two thousand members would be reading your works, you will always want to be, at least, a bit close to perfection. With the themes and picture prompt, I have been able to write on various subject matters and with the themeless weeks, I have allowed my poetic mind to let loose into the poetry realm. In fact, because consistency is the key to betterment, Poetic Wednesdays has helped me better my art at least on such weekly basis. Finally, having people to read, comment and critic your works is another blessing of Poetic Wednesdays. Every online literary movement like Poetic Wednesdays, particularly the ones that equally know their onions, are firm. They help writers become better and experiment various forms of literary genres. You are a winner of the recently concluded PW 2nd Anniversary Poetry Competition co-sponsored by The Arts-Muse Fair blog. How do you describe that moment you realized you won? It was a moment of joy and ecstasy. That was not my first time of winning contests though, but winning every new time is always encouraging because they are there to tell you that you're still on point. The one thing that blew me off was how I entered for the contest; I came online and saw the contest at exactly 10 minutes to the deadline and I started scribbling, then submitted unedited, all for the love of poetry. Two days later, getting a call from a friend in Dutse, Jigawa state, that I won the contest with my 10-minute-to-the-deadline poem was wowing. With my countenance, you will think my wife just delivered a replica of me. What purpose does poetry serve for you and what is your idea of an ideal poem? The purpose poetry serves for me as a poet is that it's an avenue for expressing myself, sharing ideas and information thereby educating and entertaining my readers. And as a reader of poems, I learn, unlearn and relearn therewith. For me, an ideal poem should be rich in imagery. Symbolism is also resourceful in beautifying poetic pieces. A brilliant use of figures of speech will actually help one achieve imagery. So ideal poetry is not about grandiloquence and thunderous grammar, it's about communicating imagery even if in the simplest of language. Ask yourself why you write. Ask if your life will be complete without writing. Ask what you seek to achieve with your writing that even in the face of fear, discouragement and hot criticism you will continue. Your answer to these questions will determine whether you will continue or not. If you will stop, do it quickly and invest your time and elsewhere. If you will have to continue, then always learn, and read more than you write. Also, be consistent because "consistency is the key."